Environmental degradation of materials related to corrosion accounts for $280 billion dollars per year in damage to metallic structures. Our proven testing protocols and analysis can help prevent failure resulting from exposure to harsh environments. 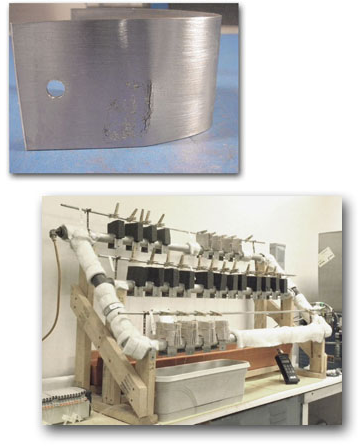 Lehigh Testing Laboratories, Inc. (LTL) performs stress corrosion cracking analysis per ASTM C692. This testing determines how much influence various thermal insulations have on the tendency to cause external stress corrosion cracking (ESCC) of austenitic stainless steels as the result of leachable corrodents. The test is performed by placing a pre-stressed specimen on a heated test fixture covered with the subject insulation. A controlled amount of distilled or deionized water is then applied for 28 days, after which the specimens are inspected for cracking.